This is the first desktop calendar I created for NZ Job Squad and Maori & Pacific Jobs while working at Native Council. Named Nga marama o te tau – Maori Calendar 2010-2011, the calendar begins it’s measurement from the month that Matariki (Maori New Year Festival) begins. The calendar contains 12 unique illustrations that are a visual representation of the whakatauki that has been used for that month. 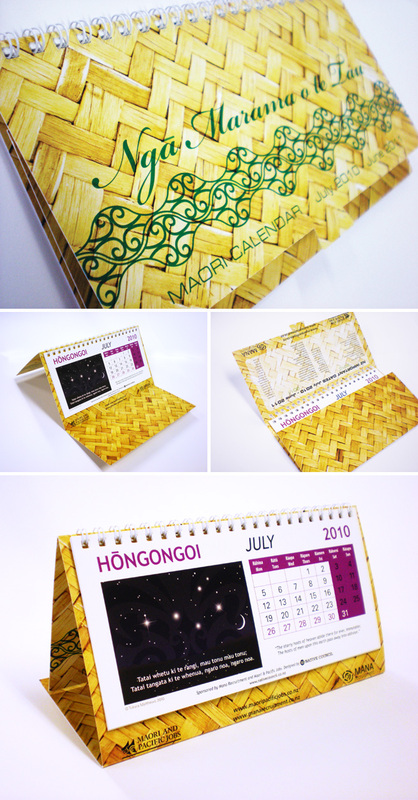 The cover is an image of some raranga work and has a unique die cut that allows the cover to fold into itself and become a stand. The cover is also wirebound to allow the user to flip the page over to the next month. The clients, NZ Job Squad and Maori & Pacific Jobs, used this unique design solution as promotional marketing material that they send free-of-charge to their clients and potential clients. Kia ora! My name is Tukara Matthews – I am a designer and illustrator currently based in Tauranga, New Zealand. I specialise in creating unique and authentic Maori and Pacific design and illustration solutions. I welcome any opportunity to apply my unique skills, knowledge & services to organisations, whether it be locally, nationally or worldwide. Get your monthly updates and the odd freebie here.